The Biggest Loser: Canine: St. Bernards/Rule #1. Don't postpone daily walk. St. Bernards/Rule #1. Don't postpone daily walk. Tuesday night instead of taking Lara, Ollie and Barney for their 5 p.m. visit to the dog park, I decided first to make oatmeal cookies for a dinner at Sharon and Richard's at 7 p.m. My thought was to take the pups to the park while the cookies cooled. So I pulled out oats, cinnamon, eggs and flour -- then ran to the store to pick up butter and brown sugar. I arrived home to what looked to be a blizzard in the kitchen. 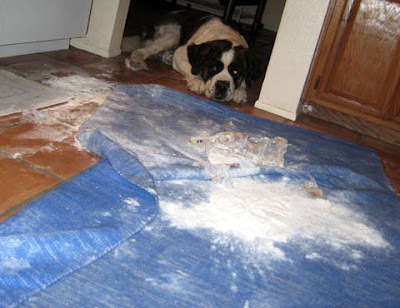 Lara and Ollie were hiding while Barney, the only one tall enough to reach the flour on the kitchen counter, was unapologetic. Hahaha, that is hilarious! Someone has a temper!! Ooops. Lara Gains 4 Lbs.